WITH strong winds gusting 37 knots, Clyde Corinthian Yacht Club’s Round Shuna Pursuit Race proved a testing ‘blast’ for all competitors. Many opted to remain in the shelter of Craobh but for those who braved the conditions it was a fast pursuit with Colin Crawford’s Dehler 35 Nimrod from Oban Sailing Club first over the line in the 30-strong fleet. Nimod lifted the prized case of bubbly and the Camus Trophy. Pursuit races see yachts leave according to handicap with the theory they all finish together. Competitors in the Round Shuna can decide which way to circumnavigate. This year’s favoured option was north about and close behind Colin in Class 1 was Joey Gough’s Tangle o’ the Isles, also from Oban. Stewart and Dorothy Ritchie’s Contest 41 Anna Mae from Salen, Loch Sunart, was third. Class 2 was won by Brian Wiseman’s Storm 33 Sorr of Appin with the conditions befitting the Westerly Storm. Brian and team also won the feeder race from Ardfern the previous day and so lifted the top prize for the whole weekend and the Craobh Haven Challenge Cup. Alistair Pugh’s Contessa 32 Marisca was second in Class 2 sailing just two up and Donald Smith’s Maxi Tilty Too third. Alison Chadwick’s Hot Toddy took Class 3 from Hamish Whyte’s Elizabethan 30 in second and Alan Manson’s Cutlas 27 Dark Islander third. Alan also lifted the Brendan Bucket for the last boat home. Several Flying Fifteens were forced to retire in the strong winds but Clive Brown’s Ffaolcuain and David Attwood’s Okey Dokey kept their cool crossing the line in first and second position respectively. 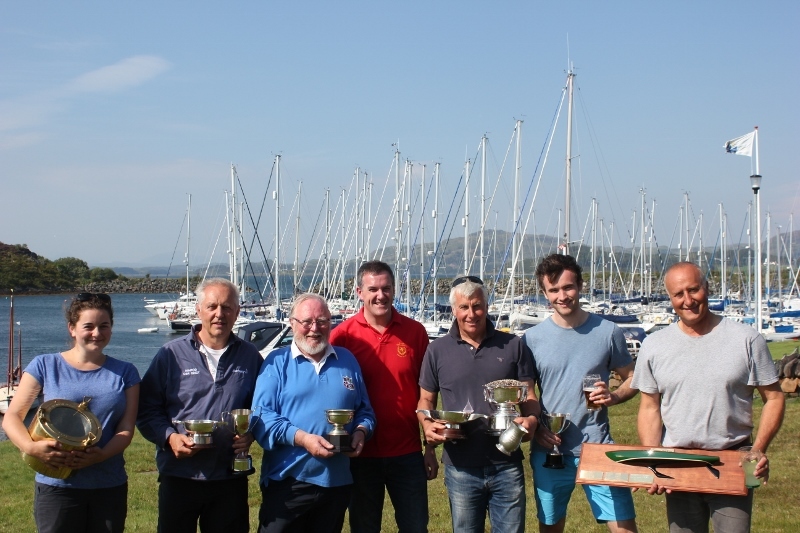 With a better amalgamated score David won the Craignish Sailing Club Trophy for the best performance from a Flying Fifteen for the weekend. Andrew Chapman made a brave effort to sail his full rig Laser in the stormy conditions but a broken boom at the north end of Shuna ended his chances of not only being the only dinghy out but regaining his dinghy trophy of last year. Round Shuna Race 2015 winners collect their trophy's. With a long beat for the Oban boats Eric Chapman and team found form to win the feeder from Billy Forteith’s Shadowfax. Hot Toddy was third. The Ardfern race saw a mix of conditions and Sorr of Appin took the honours from Alan Gent White’s sloop An Sulaire. Donald Smith’s Tilty Too was third. David Attwood’s Okey Dokey won the Flying Fifteen Class from Brian Johnston’s Reckless and Russell Anderson’s Toff in third place. Despite a much reduced fleet due to the inclement weather the weekend was a great success. Commodore Kenny Macdonald thanked everyone for competing in the challenging conditions. Kenny commented that it was unfortunate that some entrants did not manage to start Sunday's race and that some who did were unable to finish. For everyone else the warm sunshine and strong winds brought a good day's sailing in what continues to be the Club's most important event of the sailing calendar.